If you’re familiar with David Fincher movies, you know they focus on serial killers, robbers, brawlers, and murderers alike. You might also know that he has a reputation for being an exacting, obsessively technical director. The precision — and restraint — with which Fincher stages his actors, selects his shots, and moves his camera, stand as required analysis for any director. However, dark subjects and visual meticulousness belie Fincher’s overlooked secret weapon: his ability to connect with actors on a human level to draw out authentic and defining performances. This humanity, this messy warmth, doesn’t simply transcend Fincher’s bleakness and robot-like technical rigor: it exists because of it. That’s the genius of Fincher’s style. Let’s dive into some of this genius. Could it be that such a control-minded, sin-adoring director actually excels at working with actors, and, under the radar, makes this human connection the crux of his style? That a guy who has put actors through an average of 50 takes per scene, who has said, “People are perverts,” has a secret sympathetic worldview as a filmmaker? From David Fincher’s shots to his lighting, from his color palettes to the way he schedules shoot days, all signs point to yes. Fight Club director David Fincher (center) directs Edward Norton and Brad Pitt. How does a shooting schedule give insight into a director’s true nature? Cinematographer Erik Messerschmidt says in IndieWire that Fincher approaches “all of that technical stuff” with a clear purpose. Fastidious shot selection, intense preparation, painstakingly orchestrated blocking and camera moves — it all comes down to giving Fincher more time with the cast. “I’m going to have you do it until you have gone past memorizing it, gone past knowing your own name, until we can get all of the physical nonsense so ingrained that we can get to what the actual text is,” Fincher says in IndieWire of his directing style. Physical nonsense. All of that technical stuff. In David Fincher’s movies, everything exists as a means to present the heart of the matter: a genuine human performance. 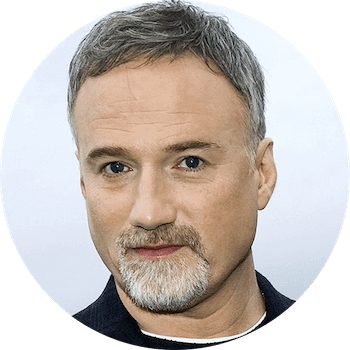 David Fincher's expertise in visual storytelling comes from three key decisions he makes regularly. How he stages his actors, the way he shoots these actors, and how he moves the camera, all help to show the story, instead of tell it. Fincher's use of these techniques help show his character's emotional state, and reveal character dynamics. Let's examine how he uses each of these techniques, ending with an example of how they work together. Let's start with a very common example of staging with purpose. The way a director stages his or her actors in a scene (also called blocking), is typically done to advance the story in some way, or reveal character dynamics. A basic example of staging with purpose is when two characters are on the phone with one another. This is a very common example, and throughout cinematic history, the best way to show this is by having the actors face the same direction on the screen. This implies the characters are talking to each other, and that they're not just on the phone at the same time. 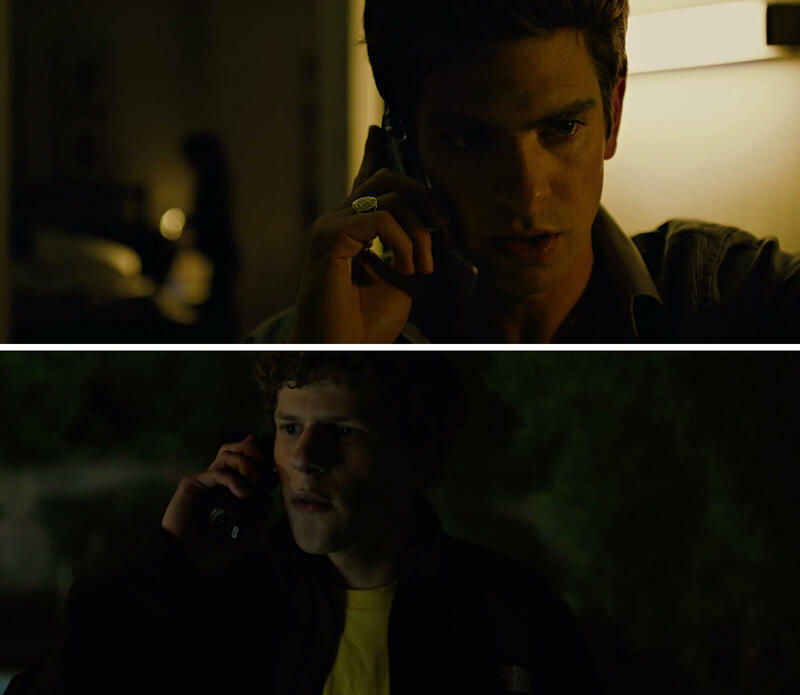 In The Social Network, Fincher breaks this tradition to reveal the rift between two characters. Eduardo and Mark are on the phone, fighting. Instead of having them face each other, Fincher decides having the two actors look in opposite directions, would reflect the conflict in their friendship. For more on staging and blocking, check out StudioBinder's FREE masterclass, and the video below, offering some incredible insights on these visual storytelling techniques. 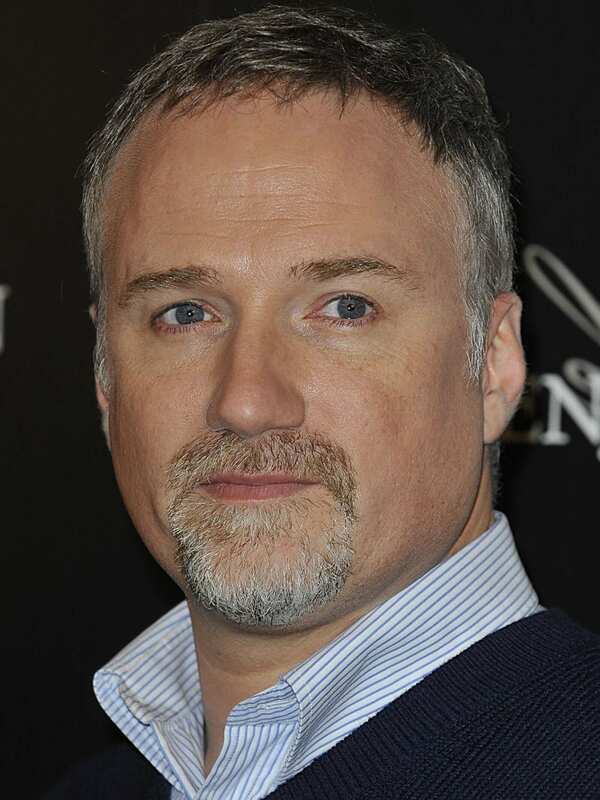 David Fincher's directing style is also characterized by his meticulous shot selection. Let's examine a few and see his purposeful precision at work. Another cinematic technique favored by Fincher is the wide-angle shot. He uses wide shots (also known as full shots or long shots) to display a character’s environment and situation. Wide shots literally shoot subjects from a distance, but when used in David Fincher movies, they tend to have the opposite effect: they give the audience a gut-level understanding of a character’s immediate predicament. He mostly shoots wide angles, so the audience can see everything going on and get to know the characters situations without needing too much dialogue. This infrequency ramps up the intimate connection to character when he does choose to cut in. So how come David Fincher movies use close-ups so sparsely? Every time you go to a close-up, the audience knows, ‘Look at this, this is important.’ You have to be very, very cautious and careful about when you chose to do it. David Fincher’s directing style is characterized by purpose. For Fincher, a close-up has to be respected and used only when absolutely necessary. Because of David Fincher's limited camera movements, (that we will discuss in the subsequent paragraphs), I wanted to examine the few times he does make the decision to move the camera, and why. Fincher matches his camera moves to the movement and behavior of the actors in the frame. As characters move, so moves the camera. This is where the idea that Fincher “locks onto performance” gets technical. Sometimes actor and camera move together in big ways; sometimes a minute blink-and-miss-it eyebrow raise motivates a granular camera tilt to match. In the shot list below, check out how Fincher sets up the audience’s constant connection to Amy Dunne — a duplicitous murderer — in a scene from Gone Girl. Click below to find out how StudioBinder can help you plan your camera movements with its shot listing and storyboarding feature. The camera moves when the character moves, and stops when she stops. Fincher employs this movement-matching style in all his projects, and Pushak describes how it results in a much tighter connection to characters than the less-precise, looser framing styles of other directors. By tying camera movement to human movement, Fincher fuses viewers to the humanity of his characters, inspiring the audience to empathize. Even though Fincher’s technical precision, his staunch attention to detail, has earned him a reputation as a machine-like disciplinarian, the effect of the work swings completely in the opposite direction. The matching technique needs strict timing and rehearsal to pull off, which could contribute to Fincher’s notoriety for putting actors through so many takes. When Fincher does move the camera, he won’t give the audience any sense that a person (a filmmaker) is guiding the storytelling. He executes an inhuman, personality-free point-of-view because he wants drama and connection to come from where it counts: the characters on screen, not the hands holding the camera. This kind of polish doesn’t come from a run-and-gun filmmaking style. It requires planning. Truth is, for a shot to look like no human had anything to do with it, a lot of human work hours are needed to bring it to fruition. This shot took two weeks to shoot. Creating this kind of smooth, omniscient cinematic look calls for thorough preparation. Fincher’s technique to keep the camera fixed is more common. Director, David Fincher rarely uses handheld. The Girl with the Dragon Tattoo relies on a handheld camera in only two scenes, Zodiac in one, and The Social Network in a lone three-second shot. Fincher movies try not to draw attention to the camera any more than necessary, so he almost always favors the stability of a tripod over handheld shakiness. He doesn’t move the camera often, won’t inject personality into his camerawork, and tends to avoid the use of handheld. Fincher won’t move the camera unless he has a compelling character-based reason to do so. This means he usually won’t move the camera. He’ll keep it fixed. The stillness of the elevator scene in particular guides the viewer to drink in the characters’ thoughts and emotions. It puts attention squarely on every subtle smile, eye shift, and internal mulling-over of the Holden Ford, Wendy Carr, and Bill Tench characters. Even though Asif Kapadia (Senna, Amy) directs this episode, executive producer and frequent Mindhunter director David Fincher’s fingerprints are all over it. He guides the creative vision for this and all other episodes of the series. Obviously, these techniques do not exist in a vacuum. They almost always work together. The way Fincher stages his actors, how he shoots them, and how he moves the camera, reveals key information to the audience. At a glance, we can see his techniques at work. 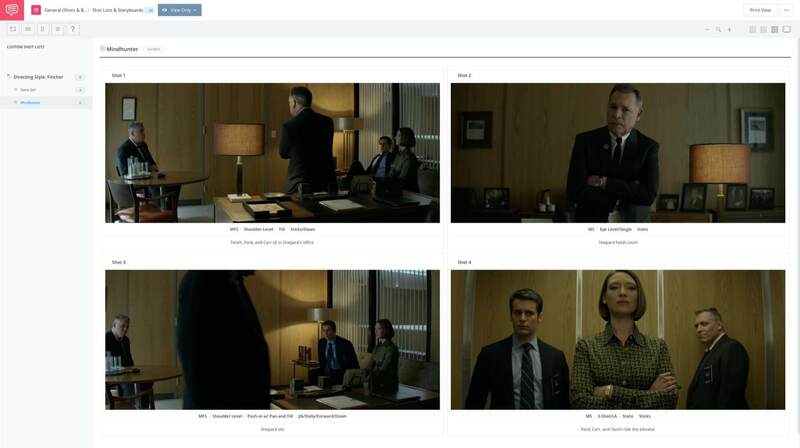 But let's take a deeper look, shot by shot, how this scene in MindHunter employs all of Fincher’s techniques—staging, shot composition, and particular camera movement. Here’s the sequence shot by shot. The​​ FBI bigshot in charge. Shepard gives information through dialogue: the trio is getting a lot more money to continue their work, but it comes with increased public scrutiny and decreased FBI protection. In short, good news for the three office guests, although it leaves Shepard feeling a bit powerless. When Ford, Carr, and Tench leave the meeting, the fixed medium three-shot incorporates a low angle. The trio now appears powerful, like larger-than-life superheroes. As a nice button on this point, Carr even crosses her arms to mirror Shepard’s power stance at the top of the scene in the office. Technical simplicity, loaded with humanity​​ (and power) of character. Click the full shot list below to see how each decision was motivated and how you can do the same for your upcoming project with StudioBinder's software. StudioBinder's shot listing feature allows you to check the camera specs, and notice how varying shot sizes combine with limited camera moves make viewers feel what the characters feel. Fincher’s reluctance to move the camera unless it’s motivated by character marks his partiality for human connection. This humanity, this connection to character, drives every directing choice he makes. The upcoming section considers another key cinematic element that defines David Fincher’s directing style. He uses more than just camera moves to tell his stories — he regulates color and lighting. Fincher got his start directing music videos, where he honed his ability to imbue images with story and mood. "In film, we sculpt time, we sculpt behavior, and we sculpt light," Fincher says in a Time Out interview. David Fincher movies sculpt light by manipulating the elements of cinematography and giving diligent thought to his color palettes. For instance, he uses opposing colors to express conflict, such as bright orange explosions that contrast with a cool blue office in Fight Club, or vibrant yellow panels that backdrop “man-in-black” character Eduardo Saverin in The Social Network. He uses monochromatic colors to communicate numbed characters in a stifling world, as with the Ikea furniture scene in Fight Club. He also draws the viewer’s eye to out-of-place elements and builds anticipation with discordant colors, like the orange weaponry on the torture chamber wall in The Girl with the Dragon Tattoo. Fincher says in a Deadline article, “People go to the movies to see things they haven’t seen before.” By painting the worlds of his movies with mindful color palettes, he enriches setting and character to create things people haven’t seen — and yet Fincher’s worlds often feel more familiar, more forcibly relatable, than the real world. David Fincher’s directing style and his use of color gives viewers a fast-track to fear, excitement, dread, joy, and the unexpected. Any emotion Fincher wants to evoke, color leads the way. In the past, Director, David Fincher has mocked the “spandex summer, superhero tentpole” nature of studio films, but one director who has mastered the comic book movie is Zack Snyder. Gain insight into the Batman v Superman and Justice League helmer’s cinematic elements and directing style in the next post.